August racing rocked my socks off. It was a phenomenal month of running all around. My training was spot on and my races were awesome. I’ll write about them separately starting with the first race of the month. This was my fourth running of the Bridge of Flowers 10K in Shelburne, MA. I wrote posts about my second and third Bridge of Flowers experiences, but not my first. 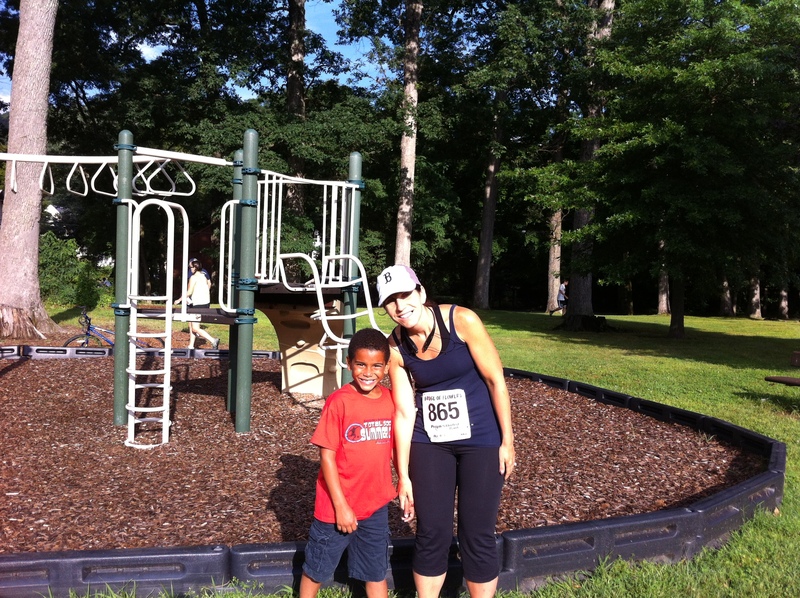 I first ran this race in August 2010 as part of my training for my first half marathon, (click the link for a cute pic of my little guy) the Hartford ING half marathon. I’m drawn to the quaint simplicity of the town Shelburne Falls, MA. My husband also loves the area and was happy to spend a beautiful summer morning there. I ran that first 10K in 1:07:36. I had nothing to compare it to so I was simply happy to have completed the race. There is something equally challenging and fun about this race that has made me want to compete year after year and strive to improve my time. This year it was all about running it under an hour. My 2013 goal of running a 10K in under an hour was fulfilled on New Year’s Day at the Sawmill River Run. I then completed the Holyoke St. Patrick’s Day Road Race in 57:08, but the Sawmill River 10K time of 56:10 is my standing 10K personal best. I wasn’t necessarily shooting for a PR at the Bridge of Flowers. My goal was to simply finish in under an hour, but best case scenario was obviously a PR. However, I had to contend with Crittendon Hill and the darn thing really slows people down, right down to a walk. I train in a fairly hilly area as it is, but to amp up my hill training I also began running up a nearby mountain once a week to simulate the experience at Shelburne Falls. The pre-race vibe is so enthusiastic at this race. It is super family friendly. There is a short 3K walk/run before the 10K for kids and parents alike. The town is very picturesque and the actual Bridge of Flowers a stunning pre-race sight to see. For the second year in a row my college roommate came out for a visit to cheer me on so we have now deemed it an annual tradition. She is hoping that her knee issues resolve so she can run it next year. My husband and son were there to cheer me on as well. I’m not going to lie it’s like pulling teeth lately to get the little guy to pose for pre-race photos. It took many attempts but we finally got this one. The day was insanely gorgeous. Miraculously I had the weekend off so I was well rested. I was ready to go. Instead of holding back like I’ve done in the past I placed myself smack dab in the middle of the 9 and 10 minute pace groups. The horn sounded and I broke the cardinal rule of racing…I went out too fast! Being so familiar with this course I knew exactly what I was doing. The first couple of miles are fairly easy and I wanted to gain a little time before the hill. I didn’t overdo it, but I did hit the gas so to speak. I can’t remember what my time was as I approached the base of the hill, but it was a pleasant surprise. My goal for the hill was to run as much of it as possible even if it was a slow run. This hill takes a few sharp turns as you climb your way up the steep incline. I was pleased with my progress up the hill. As I neared the top my phone rang into my wireless headphones. “Mom, seriously? !” “Oh I’m sorry I forgot about the race. Call me later.” LOL! She is a nut. I breezed down the back end of the hill. I kept telling myself I was almost done and to keep pushing. I drank from all the water stops except the last. I dug deep as I neared the bridge again and felt a surge of energy when I saw my family and my friend just before I headed back over the bridge towards the finish line. I had absolutely no idea of my time. I pushed my legs as hard as I could and as the finish line clock came into sight I knew I had achieved at least one of my goals. I was definitely under an hour as the clock ticked past 56 minutes. Despite the small town, laid back feel of the race there was nothing slow about getting our official race times. They were posted by the time I exited the finish chute. My new 10K PR set at the 2013 Bridge of Flowers is 56:01!! I earned that PR. I worked really hard for that PR. I am proud of that PR. Yesterday Diana Nyad fulfilled her long time dream to swim from Cuba to Florida. This was her fifth attempt. Her mantra throughout the swim was “You don’t like it. It’s not doing well. Find a way.” Yes find a way even if it takes more than one try. Do not give up! At 64 years old Ms. Nyad proves that age is irrelevant if we put our mind to something. She is quoted as saying, “I really do believe that endurance grows and, also, we can never discount, in any sport, the mental.” I couldn’t agree more! Woo-hoo! When you said that you were doing weekly hill work on a mountain, I had a feeling there was a PR coming at the end of this post! Nice job! Nyad’s swim resonated with me too — I saw an interview with her this morning and she said she didn’t even feel the pain now because it was dwarfed by her joy, whereas on prior attempts, she’d hurt for days afterward from the effort; so much of it is mental, just not letting yourself stop. I’m so inspired by people who don’t give up. I used to give up, well actually I often just didn’t begin things for fear of failure. No more! Aimee! That time is AMAZING. Awesome run! Thanks Emily. It felt awesome! 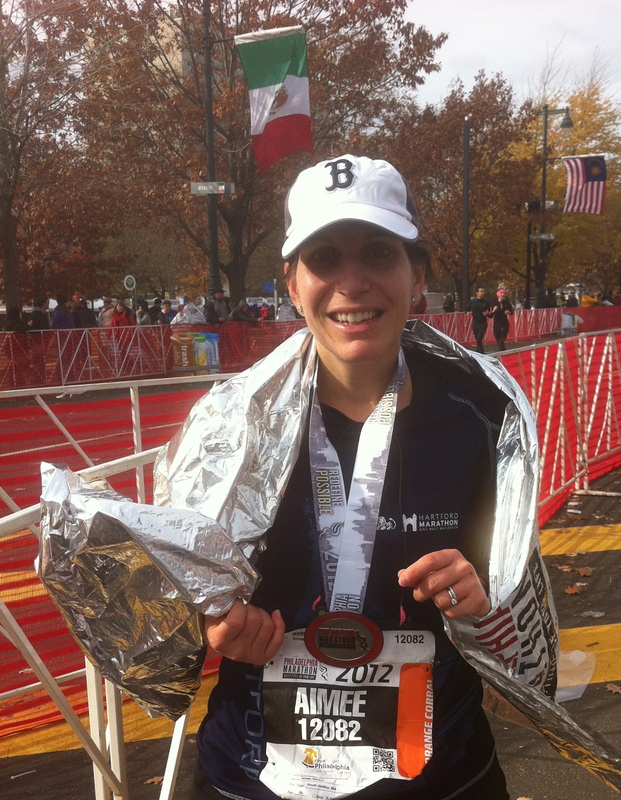 Wow Aimee…you NAILED that race!! What a great improvement in time from year to year…I’m sure it is hard to believe that you have been running that race for FOUR years. What an inspiration you are…seriously. It makes me look at me and think…”what’s holding you back?” SO, SO, SO proud of you! Oh Kaye thank you very much. In light of your news this week I am very proud of you. There is nothing holding you back and I’m so glad you jumped right out of your comfort zone to apply to that job. That’s confidence and I admire that. Seeing my times written out like that made me smile. I vividly remember wondering how anyone actually runs 6 miles in under an hour. It was mystifying! Awesome work!! You truly are amazing in motion. Nyad is an inspiration isn’t she? I have a half this weekend, very under-trained, just hoping to get out there an enjoy it. My new work routine is killing my training. Good luck Jacky! Enjoy the half. That’s what it’s all about anyway. Oh my goodness I’ve been reading up on Nyad because I think what she did is so courageous. She’s awesome!